Buy your heart shaped Valentine suckers at O'Ryans Village. When it comes to choosing a Valentine Candy, heart shape suckers are always a good choice especially for classroom parties. All kids love suckers and there are so many different ones to choose from. Charms Valentine pops are amongst the favorites. You get a whole bag of nothing but cherry flavor lolliopops that charms has become famous for. Each bag has 20 suckers. 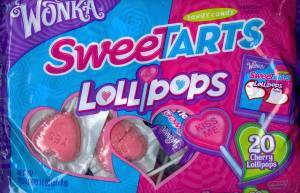 If you like something a bit more tangy then the Sweet Tart heart shaped suckers would be perfect. Get 20 cherry flavored suckers per bag. On each sucker there is a message of love. Kids always love getting a sweet sayings from the one they secretly admire. 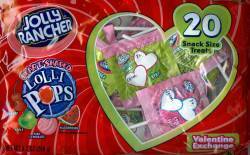 Another favorite are the Jolly Rancher Valentine Suckers. Each bag has 20 suckers , but these come in a variety of flavors. You get an assortment of cherry, watermelon and apple. These are the most popular flavors of the Jolly Rancher hard candies. One thing that makes handing out Valentine suckers perfect are that they are a smaller candy. You can tape one right on your Valentine card so not only are you getting a card but also a Valentine candy. What's really cool with the Sweet Tart and the Jolly Rancher heart shaped suckers is that you can write to and from right on the wrapper. You have your Valentine card and candy all in one. These also are great if you are making Valentine cupcakes or other home made treats. Just unwrap the sucker and cut just part of the stick off and place in your cupcake. So here you have it, our most popular heart shaped suckers. There are many others also , however these are our most popular ones that kids seem to love.